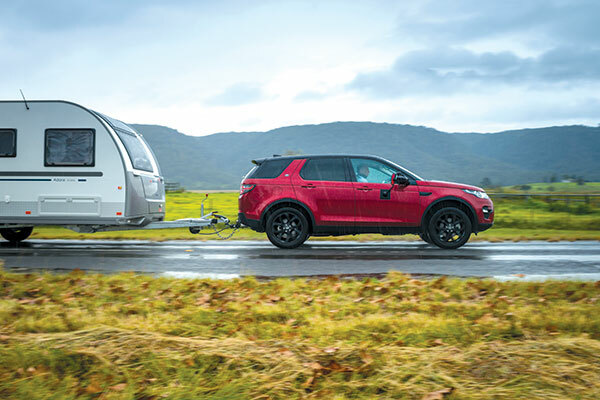 Land Rover’s medium SUV, the Discovery Sport, has been on the market since 2015, and brought with it a high level of technology and a useful 2200kg towing capacity. 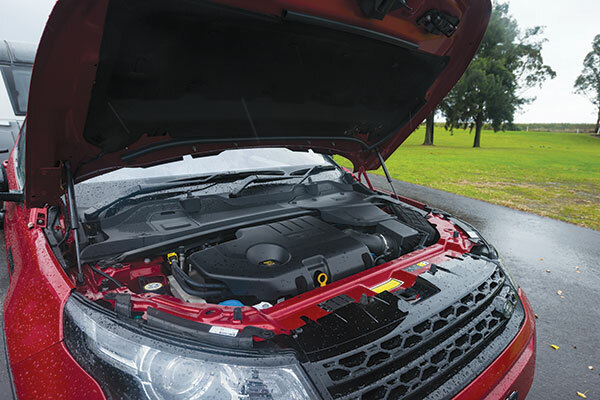 This year, the Land Rover has been freshened up with a new 2L turbodiesel engine and detail upgrades. 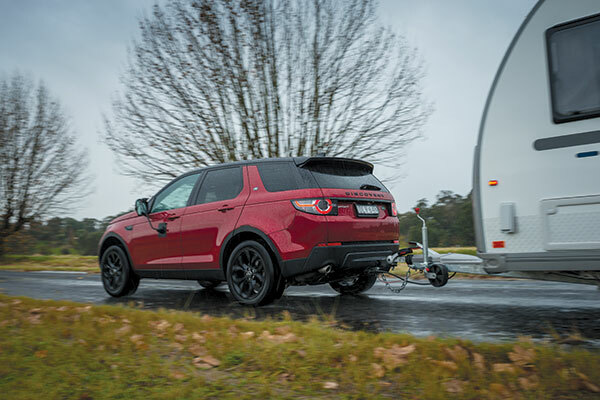 But how does the refreshed Discovery Sport go when towing? That’s what we’re here to find out. The Ingenium 2L all-alloy turbodiesel engine, first used by Land Rover in the Evoque, replaces the iron-head DW12 2.2L engine. Fuel consumption is down, power is the same and it’s 24kg lighter than the 2.2L DW12. Service intervals for the new Ingenium diesel are longer, too, going from one year/26,000km to every two years/34,000km. 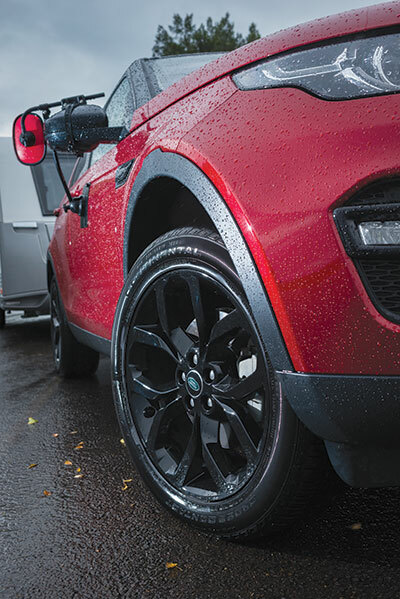 While regular towing falls under ‘arduous conditions’ that require abbreviated service intervals, Land Rover wasn’t able to get those intervals to us by the time of publication. The new model-year also sees the introduction of a Tile Bluetooth tracking device when you tick the $550 InControl apps option. 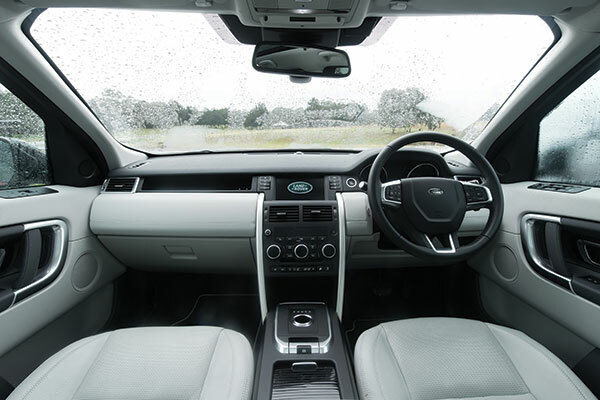 Land Rover claims that it is the first car company to integrate Tile with its in-car entertainment system. The Discovery Sport SE TD4 150 is the entry-level model in the range, although the test vehicle was not exactly basic. The SE TD4 150 starts out at $58,355 but, as tested with options, was specced $78,609. Noteworthy standard features for the Discovery Sport SE include Trailer Stability Assist, rear-view camera, lane departure warning, autonomous emergency braking, sat-nav, leather seats, power tailgate and push-button start. The interior is spacious for front and second-row occupants. Front seats lack under-thigh support but are otherwise supportive and comfortable. Second-row seating is ample for a pair of adults, although three’s a squeeze. The (optional) third row seating is strictly for sub-teenagers only. 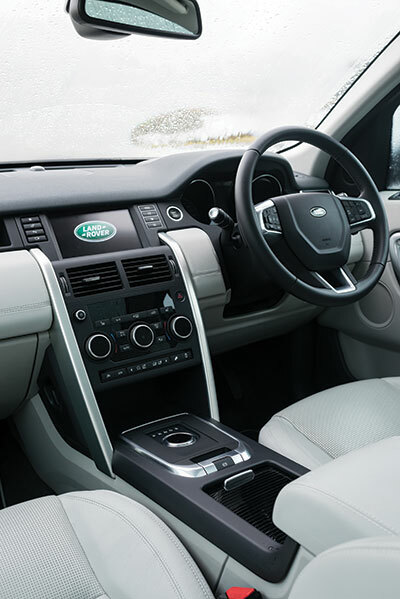 The Land Rover scores high marks for perceived quality – the materials look and feel luxurious and it all looks well put together. The instrument cluster is clear and it’s easy to find and change information menus. The same goes for the centre infotainment screen – it’s all very straight-forward. The engine is smooth and spins out freely. There is some turbo-lag, but the transition from no boost to boost is not the sharp contrast it is with some turbodiesels: the power/torque delivery is very linear. This engine (well, in this 110kW tune) doesn’t have a lot of power and torque to play with but the auto seems to keep it in the torque band most of the time and it doesn’t by any means feel sluggish. The nine-speed auto might appear to have a ratio for every occasion but, in the test vehicle, it surged or clunked during some gearshifts. In ninth gear at 100km/h, the tacho was showing about 1700rpm. Fuel consumption during mostly freeway driving slipped down to 6.5L/100km. 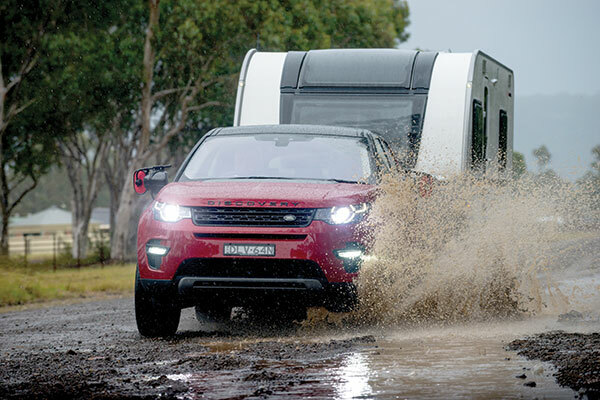 When towing a 1740kg caravan, it climbed to 13.6L/100km. While it appears pretty efficient, it needs to be with its 57L fuel capacity. 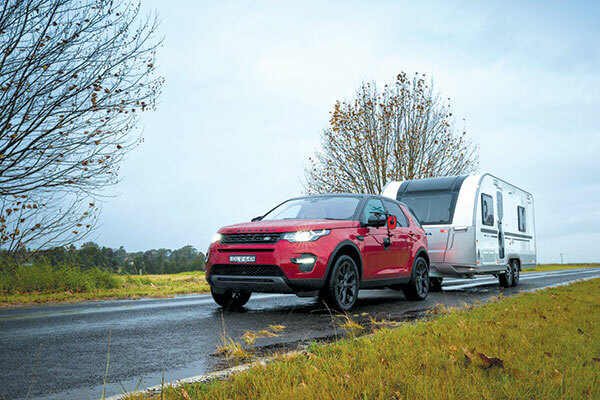 At the average fuel consumption we attained, and with a 50km safety margin, there’s only about 370km of towing touring range with the Discovery Sport. While our test vehicle was slated for fitment of electric brakes, unfortunately, it was overlooked so we were restricted to using a caravan fitted with override brakes. We were able to grab a van with a 1740kg Tare, which is up near the Discovery Sports 2200kg towing capacity anyway (once you account for payload). While tow ball mass (TBM) is up to 175kg as a five-seater, in this iteration (with the seven-seat option), TBM was just 125kg. The Adria we towed with has a TBM of around 100kg when laden, and light vans like this would be one of the few caravan options you’d have if TBM is not to be exceeded. 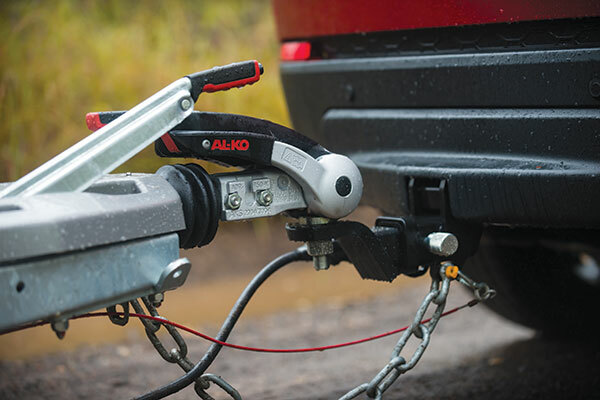 Hitching up the van was easy thanks to a well-positioned reversing camera and the Land Rover hitch supplied came with a 12-pin plug as standard. While the Discovery Sport comes with Tow Assist (which displays the predicted path of both vehicle and trailer on the centre screen camera display when reversing), you need to input the wheel track, number of axles and hitch-to-front wheelset of the trailer and then fit a tracking target sticker on the trailer for the system to work. Unfortunately, the sticker wasn’t supplied (it’s available through Land Rover’s parts department) so we weren’t able to test the system. While this vehicle’s side mirrors don’t look like they’ll take towing mirror attachments too well with their teardrop shape, we actually had no problems with fitting our Ora mirrors. The top section of the mirrors is actually not as curved as they first look, so the towing mirrors attached quite easily. With the 1740kg tandem Adria hitched up, we headed off from Sydney RV to the lower Blue Mountains. The Discovery Sport settled into an easy, stable cruise, with no swaying and very little pitching (the low towball mass helped here). One of the roads on our test loop was quite lumpy and could really show up a brittle ride when towing. While the Land Rover began to fidget a little, it wasn’t by any means the worst we’ve driven over this surface. Hill climbing isn’t a forte with the 110kW version of this vehicle, with speed down to 75km/h from a 90km/h approach speed to Lapstone Hill at the base of the Blue Mountains. However, engine braking down the hill was very good, although we suspect that the override brakes on the caravan were helping out. Given its free-revving nature, it’s likely that engine braking won’t be as impressive when using electric brakes. 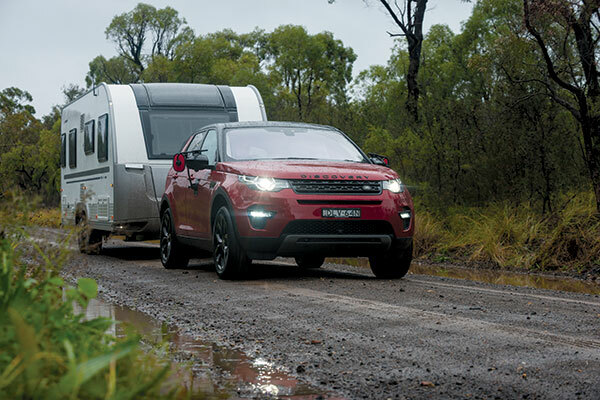 While its lack of fuel range for those long outback transport stages is a worry, the Discovery Sport SE TD4 is a nimble, stable, comfortable, willing and fuel-efficient tow vehicle for towing mid-weight caravans. Thanks to Sydney RV of 9/20 Lemko Place, Penrith, NSW, (02) 4722 3444 for the loan of the caravan for this test. The full tow test appears in Caravan World #565. Subscribe today for the latest caravan reviews and news every month!